Jennylyn Mercado Reunites with Derek Ramsay in an MMFF 2017 Entry "Almost is Not Enough"
The supposed to be "#WalangForever" reunion of Jennylyn Mercado and Jericho Rosales turned to be an "English Only Please" reunion of Jennylyn and Derek Ramsay. Derek replaced Jericho in the new romcom movie which is also the official movie entry of Quantum Films in the 2017 Metro Manila Film Festival (MMFF). This is because of Jericho's conflict in schedule since the actor is doing shoots in the US. 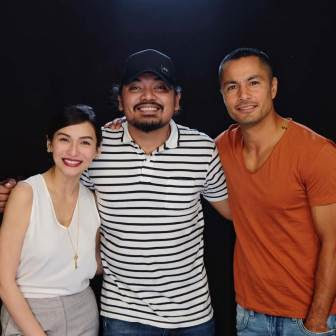 Aside from the Jennylyn-Derek reunion, the said movie which is titled as "Almost is Not Enough," reunite them with their "English Only Please" director Dan Villegas. The tandem of Jennylyn and Derek was a huge hit in 2014 after playing their respective characters in "English Only Please." The said movie bagged the most number of awards including the Best Picture and the Best Actor and Best Actress awards for Derek and Jennylyn respectively! Fans got more excited hearing the much anticipated reunion of Jennylyn and Derek. Retweets of their photos in instagram for the announcement of the said movie spread like wild fire. "Almost is Not Enough" as an official entry to the MMFF 2017 is set to hit the theaters this December 23. Awards night is set on December 27.